It's summertime and "Jaws" might be the first horror you imagine when you hit the ocean, but what about other horrifying fish of the sea? 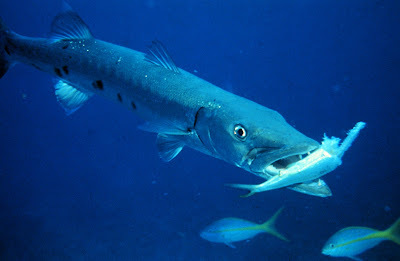 The barracuda can grow up to nearly 7 feet in length. If that isn't enough, these saltwater fish can hide along reefs and shoreline reeds. If it's any consolation for swimmers, it is found in tropical regions from the eastern Atlantic region to the Caribbean sea. Here is the account of a victim of a barracuda attack. There have been only about 19 confirmed cases in the US in 100 years, Hawaii being the location. But, it is considered exceedingly rare and the only reason attacks happen is a barracuda mistaking something for prey, such as shiny jewelry and reflective camera equipment. Piranha are found in South American waters, a freshwater fish fond in rivers. Interestingly, legitimate piranha are found in the Amazon basin as their originating source, but some have been found in a lake in Bangladesh and how that is possible has evaded the researchers. Some have been spotted in the rivers in China. So, it would seem that these freshwater fish managed to be around the world in isolated locations of freshwater and we cannot assume they swam the salty ocean to get there. Questions remain. Some assume that piranhas swim in schools to devour victims in groups, as they are not terribly big fish, but it would appear that going in groups is protective against other predators. They are not just meat eaters either, they eat plant matter as well. In fact, some say that piranhas are simply fish with teeth. Source: Attacks resulting in deaths have occurred in the Amazon basin. In February 2015, a six-year-old girl died after being eaten by piranhas when her grandmother's boat capsized during a holiday in Brazil. In 2011, a drunk 18-year-old man was attacked and killed in Rosario del Yata. In 2012, a five-year-old Brazilian girl was attacked and killed by a shoal of P. nattereri. Some Brazilian rivers have warning signs about lethal piranhas. In 2011, a series of attacks in the Brazilian state of Piauí resulted in 100 people being injured. In the state of São Paulo, another attack in the Tietê River resulted in 15 injured people. 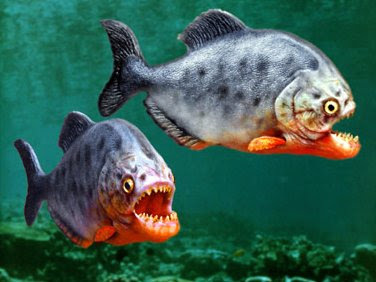 In the city of Palmas, Tocantins, 190 piranha attacks were reported in the first half of 2007. On 25 December 2013, 70 bathers were attacked in Argentina. According to one study in Suriname, piranha attacks tend to peak in the dry season when food is relatively scarce and the water levels are lower, leading to heavier than usual concentrations of fish in the water. Fatal attacks are rare, and most attacks take the form of individual nips and bites to extremities such as the feet and hands. Splashing tends to make piranhas more likely to attack, and children are often attacked for this reason. Piranha are more likely to go for toes and feet. Noise, splashing and blood are attractive to them. Some are cannibals and some are vegetarians. 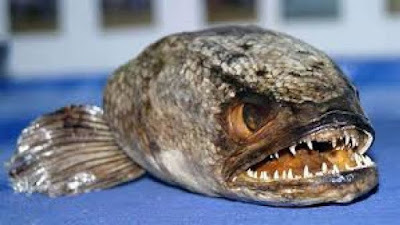 The "Frankenfish" is a name for a fish called the Snakehead. It's ugly appearance and reputation gave it the popular nickname. These fish are angry and predatory and top of the food chain without others to kill them so they can be invasive when they get into an ecosystem. In fact, these fish are so bad that in America it is illegal to have a live one. They have been found in ponds along the Eastern US and even the Potomac River. 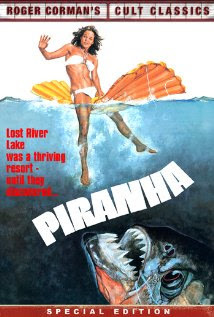 Piranha The 1978 version is the one to see. It's campy fun of a summer resort being flooded with experimental piranha. Barracuda This one came out in 1978 also and had to do with a coastal town being under attack by barracuda. Frankenfish This 2004 movie is about an investigator coming to see why a man was killed in the swamps of Louisiana.